Energy Saving - Replace 40 watt incandescent bulbs by 4W LED, SHINE HAI Dimmable Led Edison Bulbs instantly save up 90% electricity bill, while maintaining the look and feel of a classic light bulb. Excellent Performance - These Frosted Chandelier LED Bulbs provide full brightness at soft white with high CRI, creating a cozy, intimate feeling. 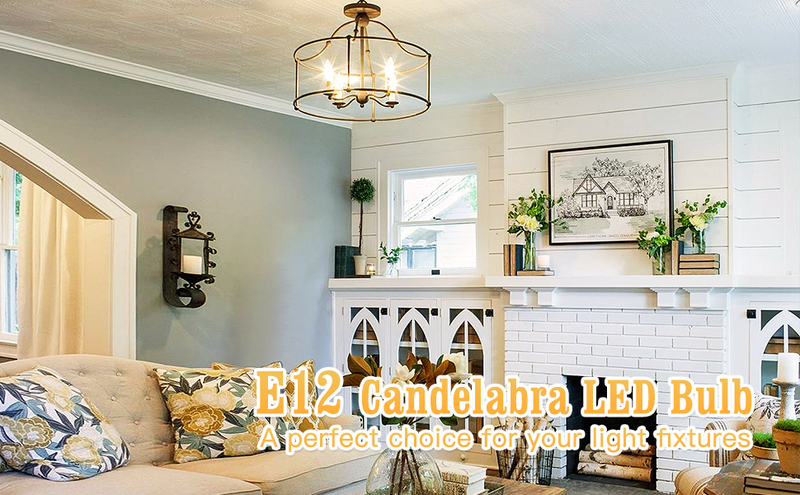 Ideal choice as candelabra LED, ceiling fan bulbs, LED chandelier bulb, candle light bulbs, type b light bulb, etc. Long Lasting & Eco-friendly - Each LED Candle light bulb provides a lifespan of over 25,000 hours, saving money and reducing re-lamp frequency. No lead or mercury. No UV or IR. Good to your children and family. Easy Installation - Standard B11 Torpedo Shape Bullet Top with E12 Base enables to screw in all American E12 base fixtures directly. Non dimmable. Hassle-free warranty - Free 3-year product unlimited warranty. Email us for any quality problem, replacement or refund would be provided under warranty. SHINE HAI LED Candelabra Bulb is an ideal choice for your home! If you are looking for some LED light bulbs with low heat generation to reduce electricity consumption and save money, why not choose SHINE HAI E12 LED Bulbs to make your dream come true!